After noblechairs shook up the scene in 2016 with their revolutionary EPIC, it has been rather quiet around this luxury brand. But remember: Haste makes waste – to be honest, nobody needs or even wants a chair inflation as it happened with DXRacer. In contrast to that noble only releases a chair when it is thought through from head to toe regarding design as well as technical features; and it does not stop there: They continuously improve their products as a reaction to consumer feedback. No redundancy, no compromises, no half-measures – each chair performs excellently in its product niche. To cut a long story short: The ICON Series is out to complement the royal product range of this brand with a fresh design, optimised components – armrests, base, backrest – and brand new ergonomic highlights. In today’s review, I will show you to whom the ICON chair might appeal regarding fit as well as budget and where to order it at the best conditions. Alright guys, my ICON finally arrived and I can not wait to get right into today’s review! Guys I do not want to spoil you but the ICON Series is just ace. I will put a voiceover or at least subtitles into my review video as soon as possible – but anyways: Watch it! Even if you do not understand a word, I think it gives you a very good idea of the chair’s style and ergonomics. What Makes The ICON Series Special? With its quality coverings (real & faux leather), precise craftsmanship, extensive adjustability and elegant design the new ICON trumps with the same charms as the EPIC does. Since the latter is considered to be an almost flawless product I am very excited to see if nobelchairs was able to step their game up even further. What is sure is that the ICON is not just another clone of a well-tried, crowd-pleasing design but an innovative product from a house that is known for its revolutionary meticulousness and passion for detail. noblechairs does not play it safe – they create greatness without compromise. What people were actually missing is a chair that also accommodates heavier gamers – will the ICON fill out this niche? Comparing the sheer measurements of ICON and EPIC, you will merely find any significant differences – that is because the real practical differences lay in its shaping. While many dimensions are identical, there are some minor variations here and there: The overall width of the ICON’s seating surface is about five centimetres smaller …smaller? Is that not a step in the wrong direction? No worries, do not let the measurements fool you – I will get into more detail later. Maximum comfort for them thighs! The EPIC already is very flexible and comfy with its flattened out side boulders and the missing “gap” between them and the seatign surface. With the ICON Series they optimized this feature by removing a steel strut from the boulders. This completely new approach results in even more breathing room for one’s thighs by further extending the usable seating surface without wracking the welcome side support. 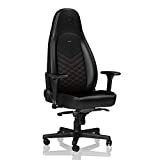 While the backrest adapts familiar design elements – posh leather optics and diamond pattern stitchings – the side support is less pronounced in relation to former standards. On its way up, the backrest does not get wider but rather tapers off to a smaller silhouette. Furthermore, the ICON took a pass on the typical belt windows rendering it more luxurious and a bit less racing-like. Alright, let us deal with those funky measurements: The shoulder area of the EPIC features a total width of 54,5cm – in case of the ICON it is “only” 39cm, but for good reason: Of the 54,5 centimetres one was only able to use about 30cm in practice because outside of this area the side boulders begin to form a bulge. While this is a welcome feature for small to averagely sized gamers – side support like getting hugged from behind – this shape can be problematic for guys with broader shoulders: The boulders push into your back/shoulder blade area disturbing the sitting experience. The ICON gives up the mainstream sports seat silhouette and gives your shoulders more breathing room while the upper back part leans comfortably against the extra thickly padded rest. The headrest is significantly more pronounced due to its even thicker upholstery – it even makes the obligatory neck pillow somewhat redundant for some gamers. The innovative shape gives the ICON Series a royal optic that rather reminds me of a throne than of a piece of racing car interior – overall a harmonious symbiosis and very promising development! The armrests have already been a major highlight of the EPIC. I am not shy to admit that noblechairs is the first manufacturer able to attach their 4D-armrests in a way that does not leave them wobbling around unnecessarily. In addition to that, the cushioning has always been above average as well. With the ICON Series they raised their game even further by exchanging the metal parts’ steel colouring with a black powder coating. In combination with the more rounded and filigree formed top part, which now presents itself in an elegant glossy design, the new armrests fit the overall picture of the ICON perfectly. Lastly, they also made the surface smoother to render them more comfy for the elbows. According to recent news, the EPIC is also going to be equipped with the upgraded armrests soon. Because the brand wants their ICON also to accommodate beefier Gamers they reinforced the base: It now is made solely from solid aluminium which – as far as I know – sets a new standard for the industry. In the interaction with its class 4 gas lift, the max load is now bumped up to 150 kilos – keeping in mind how modest noblechairs handles these technical statements, the ICON surely is one of the sturdiest gaming chairs overall. What can I say …? Everything that I hoped for came true and all my first impressions turned out to be correct: The ICON Series impressively continues noblechairs‘ product line with its great comfort and unique ergonomic features. 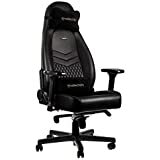 The faux leather covering noble uses for their gaming chairs with its precise stitchings, great feel and perfect alignment gets me every time – same goes for the premium real leather. So beautiful, so valuable, so comfy. Last but not least there are more than enough possibitlites to adjust everthing the way you need or want it. ICON Series Size Guide – Who’s Going To Fit In? A steel strut has been taken away from the side boulders to guarantee more breathing room for one’s thighs. They exchanged the jutting wings in the upper back area with a tapering out shape to give the user’s shoulders more freedom. Furthermore, the new shape delivers more leeway regarding the attachment of the neck pillow. The upper end of the headrest which is broader than average allows you to fixate it further up while you can also slide it further down thanks to the removed “wings”. You even have the possibility to sit without any neck pillow at all thanks to the extremely comfortable headrest which ups the room to move even more. In matters of the maximum user’s height there are two limiting actors: the sitting height and the state of the headrest (or attachment-range of the neck pillow). Overall I think 1,70m to 2m is realistic and 1,75m to 1,95m optimal. Weight-wise there is the max load of 150 kilos as well as the available space on seat and backrest that dictate the rules. Its always hard to pinpoint this because you have to consider weight in relation to height. Personally, I would not go below 65 kilos and for taller gamers I think 140 kilos is the absolute max. The ICON will not have a problem at all with a range of 70 to 120 kilos – consider a shift from more breathing room to more support within this 50kg range. From concept to realisation noblechairs has done everything right with their new ICON Series. The ballsy step away from well-tried design affectations and towards a whole new silhouette is a total success: They now serve a broader audience by counting in comfort-lovers as well as gamers with a wider frame. Also, the massive base and the effectively broader seating surface open up new potentials for heavier gamers, which will feel way comfier anyway due to less aggressive side support. The brand’s name again has been implemented iconically into the ICON’s design: the symbiosis of luxury sports seat and royal throne-like optics renders it thoroughgoing noble. One of my favourite upgrades is the more thickly padded and slightly bulging headrest whose distinct shape gives the user more leeway in matters of users height. Details like the small design and functionality adjustments for the armrests proof once more how much of a stickler for details noblechairs is when it comes to developing a new product. Their effort for non-stop optimisation is just commendable – and they make it look easy! With its unique design and premium quality the ICON Series is an ingenious addition to the noblechairs arsenal. This second big step on their way to dominating the gaming chair niche proofes what I have been predicting ever since reviewing their debut: This brand is a pioneer. They do not just add chairs to their range, they diversify and release innovative products that make sense. They innovate to please your, my needs AND they keep it rolling with well-wrought upgrades. With the ICON a dedicated and ballsy team of experts brought us a chair, that convinced me to the fullest – needless to say that the GOTURBACK.UK Platinum Award is well earned. No question, I would always go to overclockers UK first since they know noblechairs’ products to the detail. They also offer the best prices and their support is second to none.